Arctic Sleep is a Chicago & Milwaukee based band that incorporates elements of space-rock, doom metal, and ascension drone into epic songs driven by a unique combination of massively atmospheric heaviness and bittersweet melody accompanied by calm & ghostly vocals delivering lyrics containing recurring themes of nature, space, sorrow, and detachment. Additional backing vocals by Emily Jancetic. Arctic Sleep may have lost some of their heaviness over the years but that has only increased the emotional intensity of their music. Passage Of Gaia is Arctic Sleep's 6th album and it sees the band lay their emotional scars upon to the world to witness. 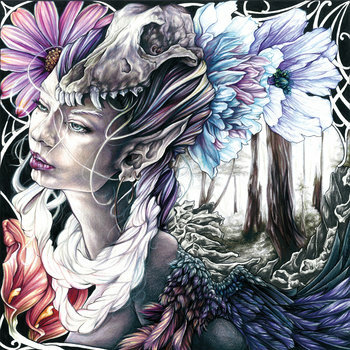 It's a haunting and brooding epic album that only Arctic Sleep could of made. These self proclaimed – Progressive Atmospheric Doomsters – from Milwaukee, deserve credit for writing an emotionally charged albums that remains powerful from the opening note of first track – The Staircase – as it perfectly sets the scene for the next 56 mins or so. If you're expecting a heavy as hell ISIS/Neurosis type experience like their earlier albums then you maybe slightly disappointed though This album is still a wonderfully sonic crushing vision in its' own right. Passage of Gaia is more a progressive space-rock opera compared to their last few albums and it makes it a more refreshing and rewarding experience. The guitars and drums are tighter than ever especially on the first half of the album as Arctic Sleep feel they are channelling Deftones and Opeth in equal measure but still sounding so damn original. Progressive Metal combining with Doom Metal has been done a million times before but none match the emotional intensity that Arctic Sleep have created here. Terra Vindicta and Green Dragon opens your mind to another world or dimension told through the power of music. Though I will admit the real “star” on this album the wonderfully subdued vocals of Emily Jancetic. Emily adds a real human feel to the album as her vocals instantly draw you in and make you feel apart of the harsh environments that Keith and Mike have created. Lets hope Arctic Sleep recruit Emily on a permanent basis. Another area where the album excels is the orchestral and instrumental work. It's epic in scope and played with intense delivery. I lost count the amount of times that I drifted off to space as the album has a hidden hypnotic trance based feel to it. Passage Of Gaia is an album you will lose your entire mind to. The 2nd half of the album is where Arctic Sleep excel the most at as they include ideas that will have you thinking out loud for days. The title track – Passage of Gaia – is a work of progressive art. It includes many vibes and emotions that you may need a degree of some sort to fully understand. The riffs take a life of their own as the Doom and Gloom effect of the album fully starts to come to life and make you question your very own existence. Arctic Sleep are finally starting to get the recognition they truly deserve as one of the most imaginative, original and forward thinking bands within the Progressive Metal/Atmospheric Doom Metal scene. They prove with Passage Of Gaia they are one of the landmark bands currently within the Progressive Doom Metal scene. Passage Of Gaia is not only their finest work to date. Passage Of Gaia is a work of art. Thanks to the band for sending me a promo to review. Passage Of Gaia is now available to buy on CD/DD/Vinyl from BandCamp now.